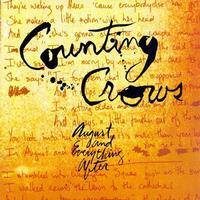 Counting Crows put in the gigging hours during the early days of the band, and it paid off. By the time they signed to Geffen in 1993, they had already built up a significant fanbase. Their debut, August and Everything After, produced by T-Bone Burnett, was released later the same year and became an unexpected multi-platinum hit, partly as a result of the successful single "Mr. Jones." "We were fortunate that this was recorded to analog in an age that had many digital recordings," says Acoustic Sounds founder and CEO Chad Kassem, who describes August and Everything After as "one of the better albums in the entire '90s," with a timeless vibe and classic pop sound. Mastered by Ryan Smith at Sterling Sound. Customer Reviews (4.40 Stars) 5 person(s) rated this product. It is such a downer when I spend 20 bucks on a digital download that sounds crappy. Not this one! The vocals pop out at and the clarity of the instruments just makes the listening to this DSD a joy! I have the CD version and when I first heard this version the sound hooked me and I haven't looked back.